I love the convenience of elastic stretch bracelets—up until that inevitable moment when the elastic gives and the beads scatter across the floor in all directions. You can prolong the life of your elastic bracelets by making a few simple changes in how you wear them, how you select them, and, of course, how you make your stretch bracelets. Whatever you do, don’t pull on one end of the bracelet to form a triangle and stretch it over your hand. It stresses the elastic and eventually, it will snap. 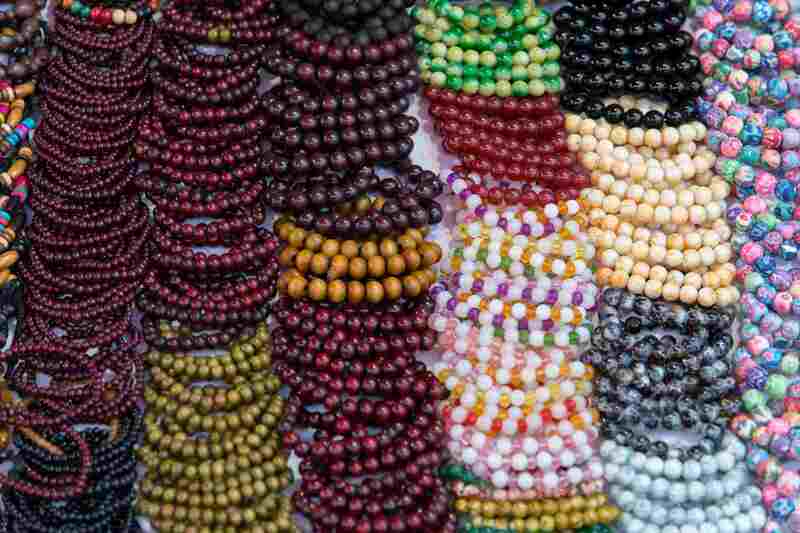 To keep your bracelet in tip-top shape, roll the beads over your wrist, stretching the elastic as little as possible. If you never take off your elastic jewelry, it is being exposed to chemicals that are breaking down the elastic over time. The shampoo and soaps in the shower, hair sprays, perfume, body lotions, and sunscreen. They all do their part to help break down and weaken the elastic over time, eventually causing it to snap. Take elastic bracelets off before applying lotions or sprays. Ideally, don't wear them in the pool or the ocean either. There’s not much you can do here except look for how it is made and plan accordingly. If you are buying a very expensive stretch bracelet and you notice a flattened crimp bead or crimp cover, you may want to pass and buy a different one. This may seem strange, but before making your bracelet, someone should have given a good tug on the elastic to stretch it out a little. You can tell when this hasn’t been done because the beads may be a little loose or the bracelet stretches a bit the first time you pull on it. When the elastic is pre-stretched, it will snap back to the same size without losing any of its elasticity. The beads should be slightly tight against each other which keeps slight tension on the elastic—and therefore the knot—keeping it from loosening during normal wear. It isn’t always possible to hide the knot inside a bead, but if you see no sign of how the bracelet was tied, that is a good indication your elastic bracelet will last. It usually means the knot has been glued and the glued knot secured inside a bead. This will protect the knot from the type of chemical breakdown described in item 2. Also, the glue can sometimes harden the elastic and keeping it securely inside a bead will lessen the stress that it is exposed to, making it less likely to fail. Well, this happens, doesn’t it? The only suggestion to limit the occurrence is to wear your bracelets on your non-dominant hand. For righties, wear them on the left and lefties, wear them on the right. You are much less likely to get your wrist caught on something with the hand that you use less often. All jewelry makers have their favorite types of elastic cord and it’s not uncommon to see commercially made bracelets with floss elastic—especially since it is easier and quicker to use. This type of thread will eventually fray, with individual strands breaking free over time until there is a complete failure. It doesn’t mean you should avoid these bracelets or this material entirely, just make sure you're aware when the bracelet uses floss and look for signs of wear and tear. Note that gossamer floss should never be used with sharp gemstone beads, crystals, or heavier beads since all of those are likely to limit the lifespan of the stringing material. Simple Changes Will Make the Difference! A few simple changes in the way you select and wear your elastic stretch bracelets will go a long way towards making them last. Many people avoid elastic bracelets, but there's no reason to if you know what to look for when you buy them and how to monitor them for wear and tear.